Analyseer alle modules en bepaal logische groepen. Ontwerp alle groepen en sla ze op in hun eigen bestanden. Leg de beschrijving van de samengestelde modules vast in een modplan.xml. Leg de rijwegen voor dit samenstel van modules vast in een apart bestand . Analyse all modules and define logical groups. Setup all logical modules independent, offline, in their own files. Keep the routes for this arrangement in a separate file, or use Modular Connections. Select with the mouse an empty grid to drag a module or to get the module popup menu. Editing Modular Layouts by GUI is only supported when there is a server connection; No off line edit possible. Most importand is to set a unique moduleID for every module! Free text for the arrangement title. The XML file containing all locomotives properties. Optional routes XML file. When using connection it is probably not needed, but it can be used for defining routes which are not possible at the momentairy implementation of solving module routes. This file is used before shutting down to store all block occupations. Swap all switches at startup to get defined positions. Allow saving the moduleplan file. Allow saving the module files. Free text for the module title. Module ID which is a reference for all other modular actions. Be carefull to change this ID because it could make the module routes invalid. XML File with the module definition. Module position in the arrangement. The side on which a module is connected. Take care: This is the real side of the module, not the rotated one! If the module is rotated to east, east side up, the connection side at the bottom of the module is west. 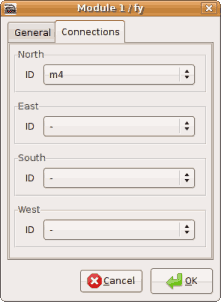 The module ID which connect to the selected side. 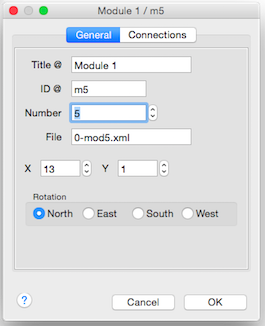 Set the wanted file name for the ModulePlan and select the module plan type. Make sure the file does not already exist. Add modules by right clicking in the Module panel and select the popup menu item Add Module. 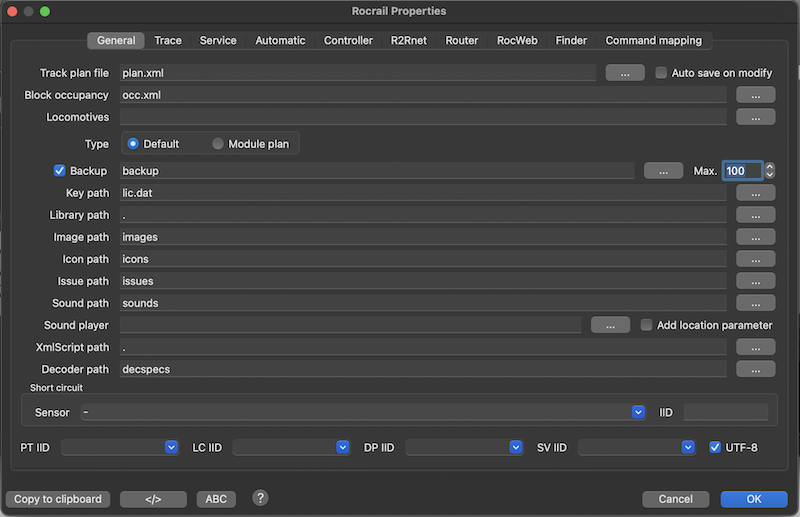 Find an empty spot in the module to drag it holding the left mouse button to another location in the Module panel. By right clicking this spot the module popup menu will occur with all options needed to configure and rotate the module. The rocrail server will get the full qualified path for new modules from the rocgui so both must share the same file system. In future version the rocgui will send the content of the new module to the rocrail server.